HOLY GRAIL – reveal 'Ride The Void' cover artwork & track-listing! Californian up-and-comers HOLY GRAIL – vaunted for their innovative 'NWoBHM' mixture of styles and talked about as L.A.’s most exciting metal band of the past two decades – have recently inked a European deal with Nuclear Blast Records! 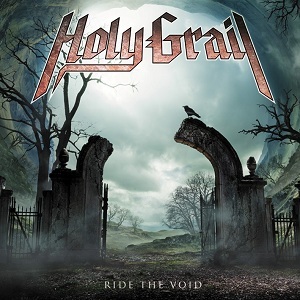 With their upcoming second studio album entitled “Ride The Void”, HOLY GRAIL will be vaulted to new heights of glory! The record is set to be released in Europe via Nuclear Blast on the 21/01/13 as a limited CD version incl. bonus track, a black 2LP version and a strictly limited clear 2LP version.